ANDERSEN AIR FORCE BASE, Guam -- Dead mice laced with painkillers are about to rain down on Guam's jungle canopy. They are scientists' prescription for a headache that has caused the tiny U.S. territory misery for more than 60 years: the brown tree snake. Most of Guam's native bird species are extinct because of the snake, which reached the island's thick jungles by hitching rides from the South Pacific on U.S. military ships shortly after World War II. There may be 2 million of the reptiles on Guam now, decimating wildlife, biting residents and even knocking out electricity by slithering onto power lines. More than 3,000 miles away, environmental officials in Hawaii have long feared a similar invasion — which in their case likely would be a "snakes on a plane" scenario. That would cost the state many vulnerable species and billions of dollars, but the risk will fall if Guam's airdrop strategy succeeds. "We are taking this to a new phase," said Daniel Vice, assistant state director of U.S. Department of Agriculture's Wildlife Services in Hawaii, Guam, and the Pacific Islands. 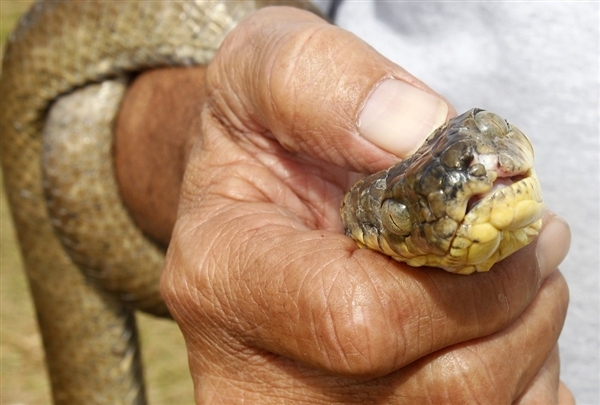 "There really is no other place in the world with a snake problem like Guam." Brown tree snakes are generally a few feet long but can grow to be more than 10 feet in length. Most of Guam's native birds were defenseless against the nocturnal, tree-based predators, and within a few decades of the reptile's arrival, nearly all of them were wiped out. The snakes can also climb power poles and wires, causing blackouts, or slither into homes and bite people, including babies. They use venom on their prey, but it is not lethal to humans. The infestation and the toll it has taken on native wildlife have tarnished Guam's image as a tourism haven, though the snakes are rarely seen outside their jungle habitat. The solution to this headache, fittingly enough, is acetaminophen, the active ingredient in painkillers including Tylenol. The strategy takes advantage of the snake's two big weaknesses. Unlike most snakes, brown tree snakes are happy to eat prey they didn't kill themselves, and they are highly vulnerable to acetaminophen, which is harmless to humans. The upcoming mice drop is targeted to hit snakes near Guam's sprawling Andersen Air Force Base, which is surrounded by heavy foliage and if compromised would offer the snakes a potential ticket off the island. Using helicopters, the dead neonatal mice will be dropped by hand, one by one. U.S. government scientists have been perfecting the mice-drop strategy for more than a decade with support from the Department of Defense and the Department of the Interior. To keep the mice bait from dropping all the way to the ground, where it could be eaten by other animals or attract insects as they rot, researchers have developed a device with streamers designed to catch in the branches of the forest foliage, where the snakes live and feed. Experts say the impact on other species will be minimal, particularly since the snakes have themselves wiped out the birds that might have been most at risk. "One concern was that crows may eat mice with the toxicant," said William Pitt, of the U.S. National Wildlife Research Center's Hawaii Field Station. "However, there are no longer wild crows on Guam." The mouse drop is set to start in April or May. A 2010 study conducted by the National Wildlife Research Center found brown tree snakes would cause between $593 million and $2.14 billion in economic damage each year if they became established in Hawaii like they are on Guam. Power outages would cause the most damage, followed by a projected decline in tourism. The cost of treating snake bites would account for a small share. Native Hawaiian birds "literally don't know what to do when they see a snake coming," said Christy Martin, a spokeswoman for the Coordinating Group on Alien Pest Species, a partnership of Hawaii government agencies and private organizations. "Once we get snakes here, we're never going to be able to fix the situation," Martin said.